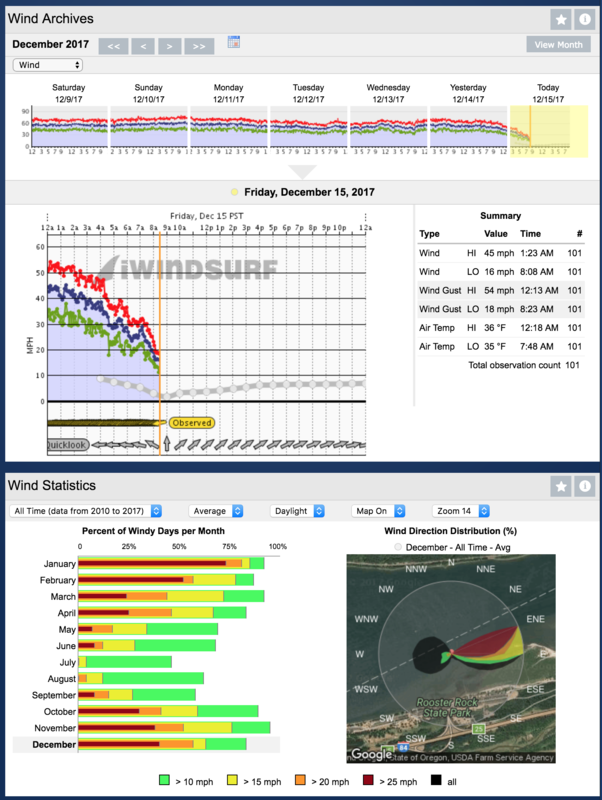 iWindsurf Community :: View topic - Whaaaaaaat??!! Really? Posted: Thu Dec 14, 2017 9:13 am Post subject: Whaaaaaaat??!! Really? Just randomly noticed the charts for Rooster Rock, shows it's been averaging 50+- for a week!? Can't be true, can it? Something wrong with the sensor? Did the gardener leave his leaf blower on? Just another windy winter week at Wooster. Didja notice the windchill? Drove by Rooster Rock a couple times last week. First thought there was somehow large ice flows on this section of the Columbia. Then I realized it was patches of thick smoke on the water. Never scene wind like that. Decided not to try my new foil there. Posted: Thu Dec 14, 2017 12:18 pm Post subject: Re: Whaaaaaaat??!! Really? Just freak'n windy! And, Cold! If you didn't see it on the Big Winds topic. That's Nukin. Look at that insane sustained wind all week long! Holy smoke, literally. Didn't fall under 20 until...just now! Posted: Mon Dec 18, 2017 3:24 am Post subject: Re: Whaaaaaaat??!! Really? And it was that same weather patterns last week, that gave huge easterly's at Rooster Rock... as the Santa Ana east winds in Calif, which made ALL the horrible wild fires. Thanks for the video link, totally entertaining, unfortunately I can relate to most of the video.